It's Not Work, It's Gardening! : Back garden going gangbusters! 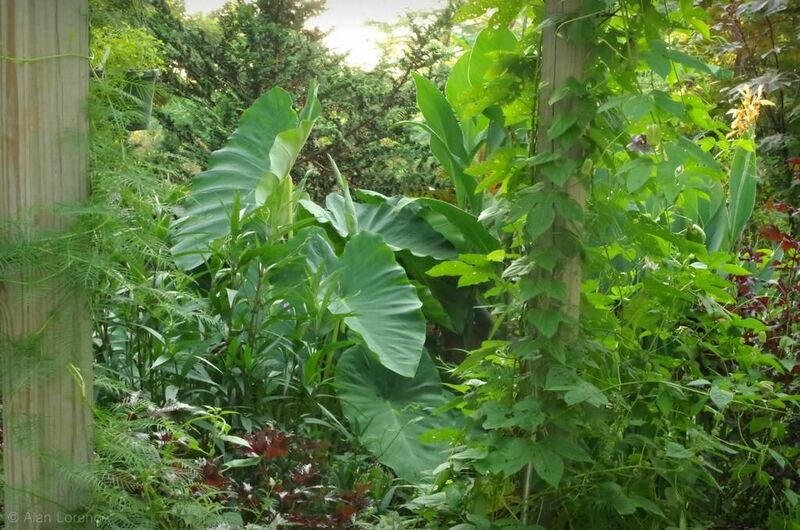 We've had a good amount of rain in August here in St. Louis -- not too much, but a bit more than is normal -- and the garden is thriving for it. 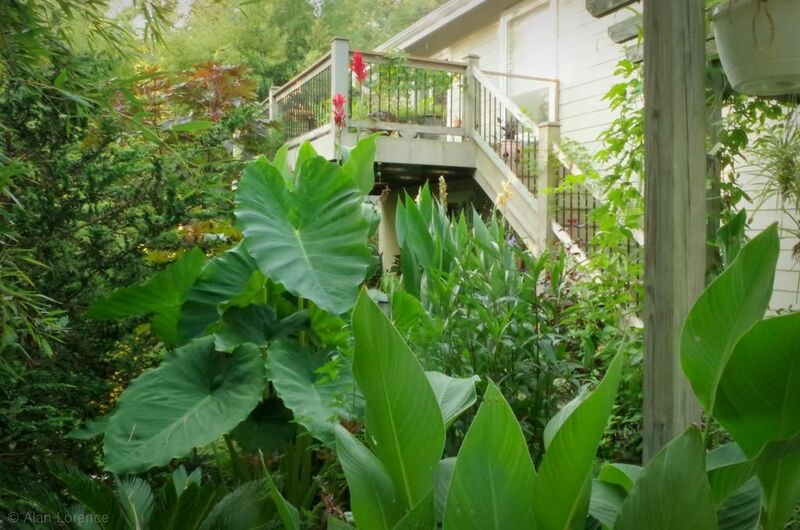 It's been a month since I showed you the back garden in the patio area, but it's really time for another look. This is from the driveway looking through the "tropicals bed" -- no longer a good description as I've got tropicals all over now. 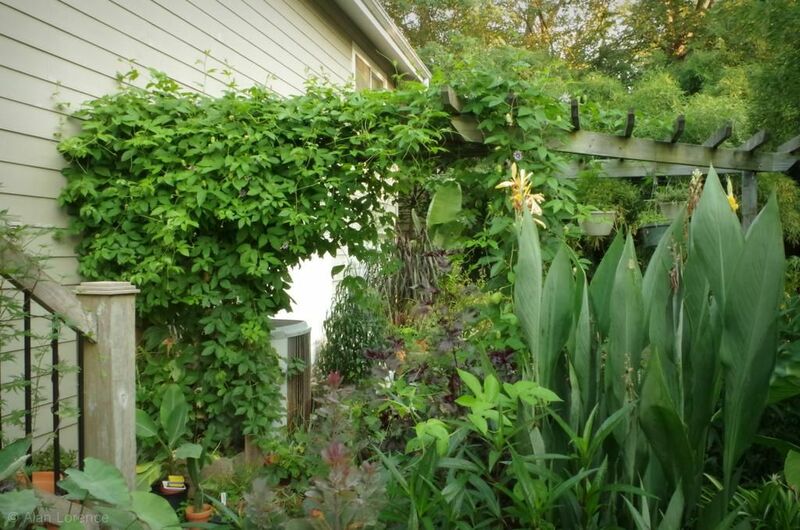 My "let it grow" attitude toward the garden this year has resulted in some nice surprises, like the cypress vine growing on the post on the left. I haven't planted cypress vine seeds for years, but they always show up mid to late summer. The other post holds maypop (Passiflora incarnata) which is also growing overhead (unseen in this photo). Those maypop vines are a bit out of control, but so fabulous! 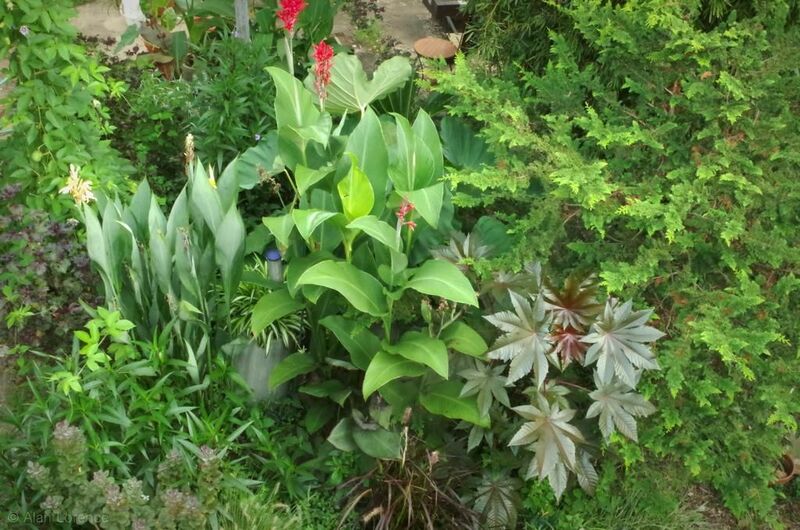 That's canna 'Paton' on the right, with its fantastically upright foliage. Is there any better combination than bamboo, bananas, and (castor) beans? Can you believe that I thought I had planted these too late for them to gain a decent size? I've not grown one here before, and luckily it isn't as large as the others or the kitchen window would be blocked! I think it might actually look better from above! 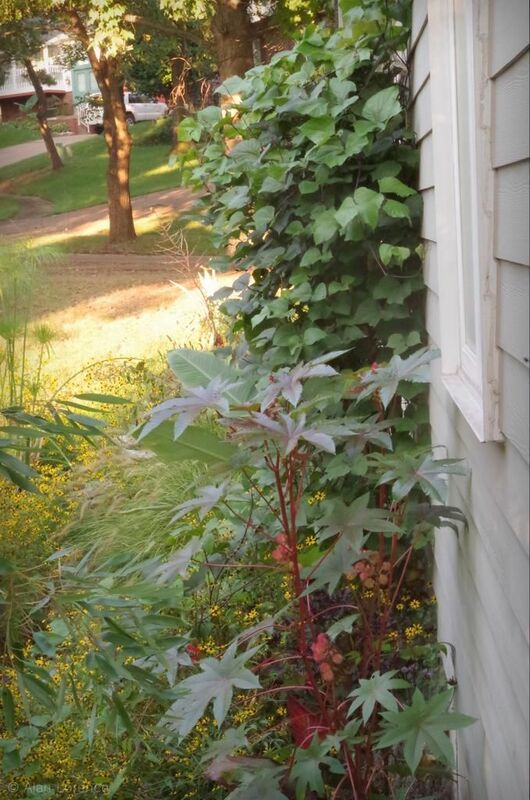 Hey, another castor bean! This was a volunteer and is in a pretty good spot. It's not too big either, which is perfect! I love how things are doing back here with so little attention this summer! 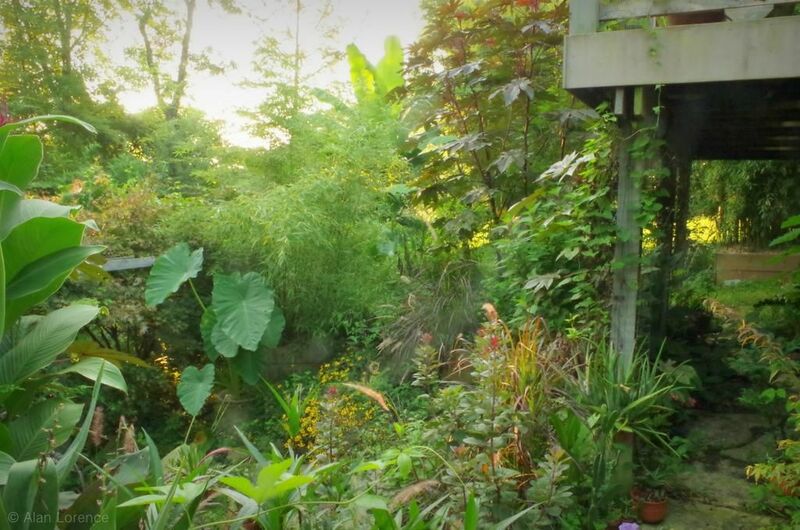 I'll show more of the back garden in posts later this week. 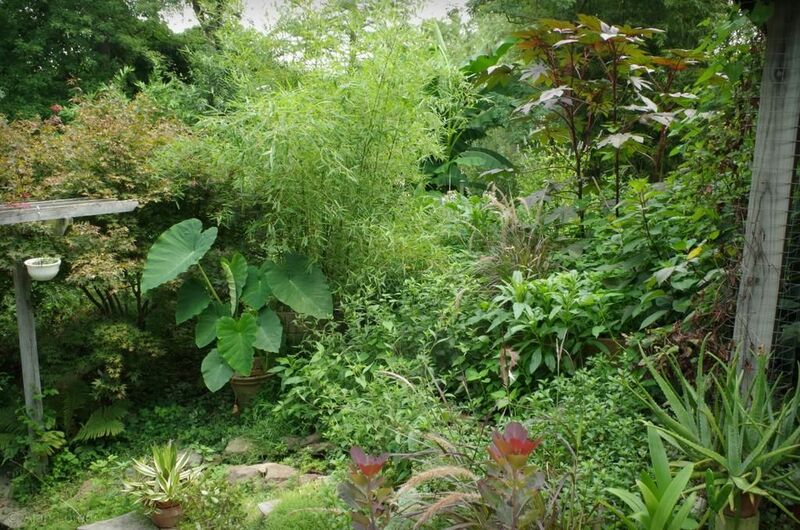 Your garden must look like a magic forest when fireflies are out. Do I get to say the L word? And the G word? Lush! Green! There, I said it! 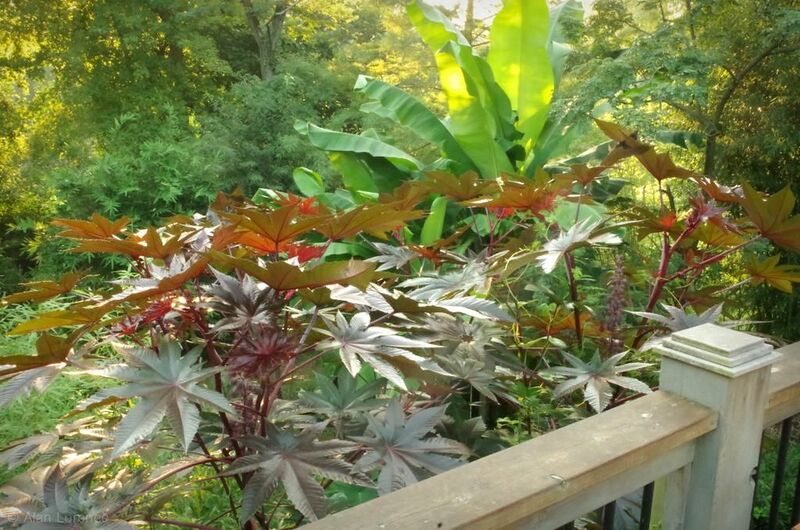 It's always amazing to me to see how huge tropicals grow in warmer summer areas! 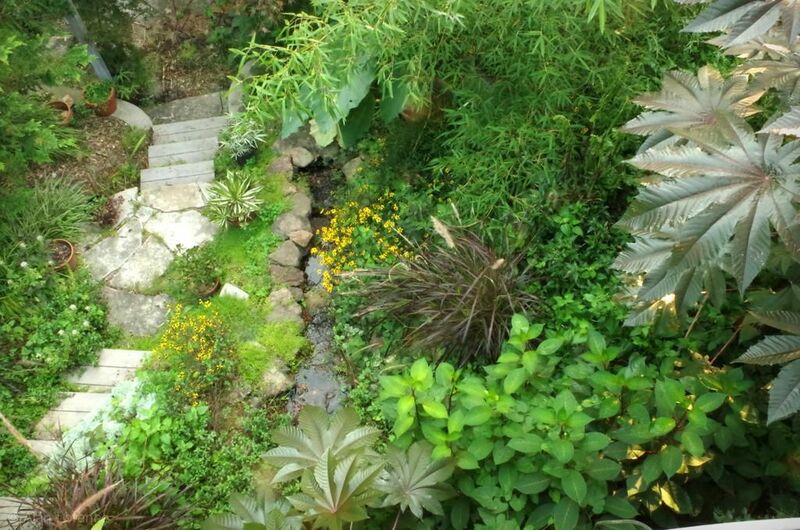 Your garden is a wonderland! In the first picture that includes the balcony, the tiny touch of red make the photo work so well. "bamboo, bananas, and (castor) beans": you got the trifecta of shape size and color. Very cool. Looking great, the tropical stuff always gets my attention! 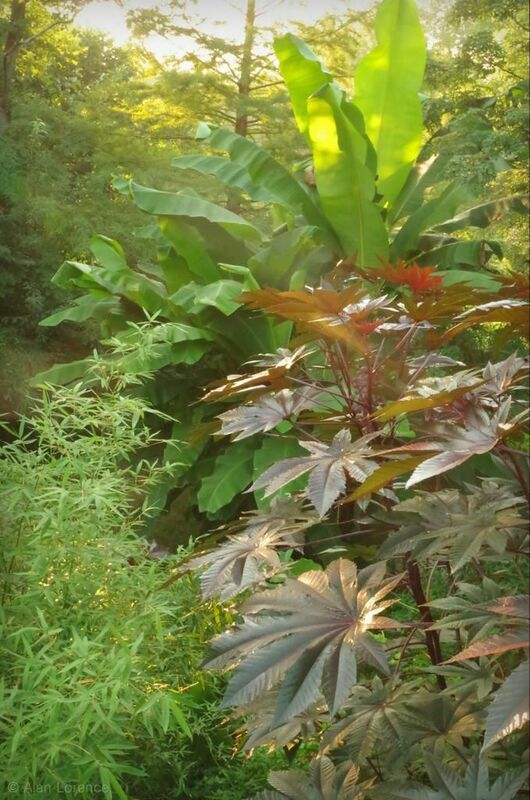 I'm growing castor bean again for the first time in many years, and had forgotten just how fast it grows--it really boosts that tropical flavor.